Expired 1wk ago . Last validated 3wk ago . Used 4 times. NOHELIA LEON Tested this deal and verified that it is working as described. Oriana Gonzalez I have tested this code and is working as described, place it at the checkout of Hairburst and enjoy the discount. wilmer This promo code is working perfectly. Put the items in your cart, go to checkout and apply your promo code to get this discount. miguel I have tested this code and is working as described, place it at the checkout and enjoy the discount. 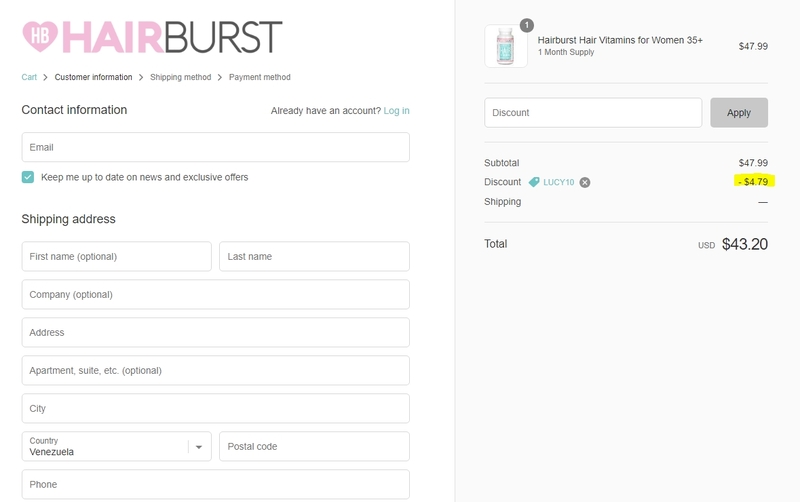 Ricardo ledezma i have tested this code and is working as described, place it at the checkout of Hairburst and enjoy the discount.